Testing 161: Statributes, Objectives, Settlements, Prestige! 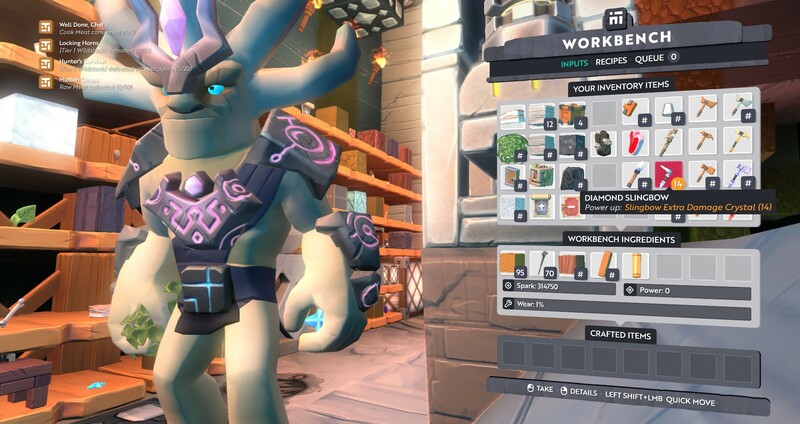 This is a significant update to Boundless. It contains many of the features we’ve been talking about over the past couple of months in the Weekly Updates. The update is a work-in-progress - but we really wanted to get something released before the long bank holiday weekend for everyone to checkout. We’ve reworked and added: Campfires, Beacons, Fuel, Prestige, Settlements, Capitals, Footfall, the Tutorial, Experience, Objectives, Daily and Weekly Objectives, Stats + Attributes = Statributes, Skills, more new GUI and HUD, and lots more. Yarbo! There’s an issue if you connected to Testing since we pushed the first build yesterday. You will be tracking all the Weekly Objectives, which will stop you tracking any new objectives, even though you have slots in the “Active” tab that are empty. The workaround is to switch to the Weekly tab and deactivate all active objectives. Beacons and Campfires are currently destroyed when you break them. Existing players will not start from the tutorial. New players will start from tutorial. You need skill upgrades to use Machines. If you already have a Beacon with machine you will need to skill-up before you can use them again. All machines do not give any message that you need to upgrade to use the machines to craft anything. The furnace also cannot be used unless you upgrade your skills but when you place copper or raw meat in the furnace without upgrading your skills, the message, “Raw Meat - Invalid ingredients”, is displayed. The compass is not on the HUD from the beginning. Skills need to be upgraded. The creature dot on the compass is also a compass upgrade. The Skills Screen does not include any detail on each skill upgrade. Description will be added shortly. It’s a work-in-progress. You can’t run until you have enabled the Running upgrade. This all makes more sense if you play through the tutorial. Locations - Location markers you saved. Beacons - Where your / friends’ beacons are. Settlements - List of Settlement in the current world. Worlds - World information with information on the beacon prestige. Skills - Need to access this screen to upgrade skills. The old Progression screen has been removed for this release. We have duplicated 3 worlds from the Live Boundless universe into the Testing universe. This was to allow us to test with real world data. As the worlds are duplicated anything changed via the Testing release will not exist in the Live release, and vice-versa. The worlds are: Solum, Epsilo and Vulpto. If you owned beacons on these worlds you should still be able to access them. No changes in Testing to the world, your beacon, or your character will transition back into the Live release. The purpose of Testing is to test the update before we release it to Live. If you want to play Boundless it’s best to stick with the Live version. If you want to checkout the new features coming then try the Testing version. If you want help find bugs and issues then try the Testing version. Maybe try Testing for a hour before switching back to the Live version. New tintable ice and glacier textures. Beacons now have a prestige value determined by a combination of factors including the types of blocks used to build a beacon, the variation of blocks within a beacon, the distribution of solid/air within the beacon and the presence of blocks from other worlds. Beacons now combine together (based on proximity in x/z only ignoring vertical distances) into settlements classified as one of an Outpost, Hamlet, Village, Town, City or Great City based on the total prestige of the settlement calculated by summing the prestiges of its beacons. The character which contributed the most prestige to the settlement will be its mayor, who can rename the settlement via a Beacon Control block within the settlement. Settlements whose prestige is too small will not be classified at all and not be given a name. The beacon control block will also show a ranking of up to the 5 top contributors to the settlement, and settlements will be visible on planets in the sky when holding the Totem. The settlement with the highest prestige will be granted the title of Capital on that world. Beacons that are part of a named settlement will generate footfall when people other than members of the beacon enter the beacon (beacons owned by the same user within the same settlement won’t generate multiple footfall payments) each day, with coin collectable from a beacon control block of that beacon. When placing a beacon, you’ll now get an entry in your ‘Beacons’ list on the player GUI and the warp conduit GUI which will provide you more information about your beacons and allow you to warp to them directly. You will no longer get an automatically saved ‘Location’ (that actually has nothing to do with beacons) when placing a beacon console. There is no migration in place to automatically add all beacons you already own, so you will need to interact with a console in your beacons and click ‘Add to Beacons’ in the Settings tab to add it to the list manually. Note that you can now also interact with a beacon as a villager to add a beacon you have permissions for to your beacons list. These new beacons will show up on the planets too for your own set of beacons. Beacons can now be given a name by the mayor of the beacon which will show up in the HUD and in the Beacons list. Beacons no longer require their columns of plots to be contiguous (can have vertical C shapes), fixing bugs in the removal of plots. Beacon plots can now be removed even if there is a console inside of them, this is a change that also removes the limit on the number of consoles a beacon has and is forward planning for beacon fuelling. Beacon consoles are purely an interface onto ‘whatever beacon happens to be that position’ and no longer store any state whatsoever. They’re just blocks! Beacons will now expire after a given period of time. Beacons already existing in the world will have approximately 6 months of life on them. Beacons will no longer automatically reserve a plot when placing a beacon control, you must fuel them to reserve the first plot and create ‘the beacon’. Beacons can be fuelled currently using leaf blocks and tree trunk blocks. Further fuel items will be added later with additional balancing and tiers of fuel. As a flavour of this, the leaf blocks will be able to take a beacon up to 3 months of life, whilst a trunk block will be able to take it up to 6 months of life in total. Campfires are a new item which acts as a device for temporary reservation of beacon area using up two plots and which has no permissions or fuelling, and takes no part in settlements or footfall. Campfires are automatically fuelled and have a life time of 1 day. Placing a beacon control into an existing campfire will ‘upgrade’ it to a beacon wherein it can now have plots added and removed, and have additional fuel added to it along with permissions. Campfires will be destroyed when the campfire block is destroyed unlike beacons. Beacons and campfires will both appear in the ‘beacons’ list of the new ‘universe’ screen which now holds the locations GUI also. The new universe screen also contains a ‘settlements’ list detailing information about settlements you own a beacon in (villager status is not enough). The new universe screen contains also a ‘worlds’ list detailing information about all of the worlds you’ve visited (there is no migration in place to auto-populate this). All XP and levels have been reset. Don’t worry though, because you’ll retain all coins and beacon plots earned so far. Total experience required to level up for the early levels has been adjusted slightly. XP is now a single pool, not tracked per profession. XP is earned by completing objectives rather than awarded for individual actions. The first tier of objectives is available. Objectives give you XP, allowing you to level up. Each new level gives you coin, beacon plots, and skill points to spend. All objectives are split by profession. One time objectives can be used to learn about a profession. Daily objectives will reset each day, allowing you to earn regular XP. One time and daily objectives must be activated for progress to be recorded. They are tracked in the top left corner of the screen. Weekly objectives will reset once a week and are always active. They provide big chunks of XP towards your next level. You’ll need to view these in the objective screen to track your progress. Press J or select Objectives menu in the Options to access the Objectives list. This can only be accessed after you have completed the tutorial. We’ve fleshed out the attribute system with lots of the underlying game systems now using attributes. You’ll probably notice you’re moving and hitting slower than you used to. Try increasing your Agility and Dexterity to improve that! There’s a whole new skill unlock system in place that lets you improve core attributes, combat competencies, and unlock some specialised skills too. Press K or select Character menu in the Options to access the Skills page. New players will start the game with just the items they have collected in the Sanctum. Player’s no longer receive a free Beacon and are instead encouraged to craft one in the tutorial. The recipe for crafting a Beacon Control has been updated, it is now made with the Crafting Table. Warp Location Picker Upgrade has been renamed to Warp Shard. All five power tier variants of Spitter models are now in the game. Spitter colours have changed slightly. Items dropped by creatures now always drop in the direction the player is facing to make them easier to find. Items dropped by creatures now stay for a second to give players time to see them before they are picked up. Melee hits are predicted on the client, so effects play when you hit a creature irrespective of latency. Point projectile damage and break blocks if their power is large enough. However only tools create block drops. Wildstock have all had their textures tweaked and will be slightly different colours now. Improved HUD for beacons to show the beacon name and it’s mayor and improve styling. Improved HUD for other basic interactable items to improve styling. Improved HUD for portals/warps to show some extra information like whether they’re in a valid state, and improve styling. New tutorial to introduce players to the game and the progression system. Added character audio for actions, running, landing and emotes. Yarbo! Increase default chunk cache size to 2GB. Added 4GB and 8GB options. Reduced the number of protocol messages being sent between the client and server for better network performance. Fixed an issue where health would briefly change after entering portals and warps. Fixed an issue where the Spark Core was still being referenced as the Power Core. Portal Configuration menu does not show correct planet name when using the appropriate portal token. Assigning both mouse buttons to ‘Use Left Hand Option’ will disable the left mouse button. To fix delete C:\Program Files (x86)\Steam\SteamApps\common\boundless\user_settings\yourname\controls.json. Cannot switch tabs on Inventory menu using shoulder buttons on a controller. Consuming meat and starberries causes the game to display duplicate message on the HUD. Game displays welcome message for a world through a portal without going through it. Game does not display a message when the maximum number of planet markers has been reached. GUI rendered incorrectly on Intel HD graphics on Windows. If the game (loader) fails to start on Windows 7 and 8 you may need to install this. Items will occasionally be unable to smart stack with other items that belong in the same smart stack category. Menus may constantly reappear on screen after closing them. [new] Dense fog sometimes visible in caves. [new] Interaction distances for placing blocks may not be consistent. [new] Objective ‘Travel Back To Your Campfire’ may not always trigger if standing near campfire but not inside the campfire area. To get around the issue, try leaving the area and return to it to see if the objective completes. [new] Some creatures may disappear instantly and drop items before their bodies hit the ground. [new] There are inactive objectives in the WEEKLY Objectives list. Weekly Dev Update: 2017 April 14th - Testing 161 and Creatures! Weekly Dev Update: 2017 April 21st - Centraforge, Poles and Faces! Testing 164: Smoother Loading and Smoother Projectiles! Release 167: Player Progression and Build Progression! "SkySaga: Infinite Isles" VS "Boundless"
Wow, well you guys have been busy, haven’t you? Good call! So much easier to type out, haha. Man…I just can’t wait for this stuff to go live! I guess reading all of it and trying to memorize it, won’t do me any good. Will just dive on to it and notice the difference. Wish me luck!!! My brain is excited. When I loged on last night (pree release) I noticed that there wer already some advanced buildings with no names attached to the beackons. Are these deve homes or high end backers? I think worlds were brought from the live client. I noticed a lot of beacons in Pixel Gate were unnamed, It’s because people haven’t named them yet. Sweet! wish I had left a stash of tools there now. Holy moley! And of course I have to leave for work right now. Oh well, I guess I know what the next video is gonna be! This all sounds awesome! Has there been any mention of when the timeframe for 1.0 to go live? Keep up the good work I have a feeling it’s all gonna pay off wonderfully! holy moly … this update is a kinda great step and makes a big difference to the gamefeeling before (“mmo” got a big “RPG” added! ^^). Hope people add screenshots because I’m at nightshift and cannot see all this great stuff (even youtube is blocked here at work ^^). Loving v161 on the testing branch. The changes around skills and leveling up are great and instantly add a level of progression the game has been missing. Did what I do and recorded some of my initial experience with this update. I got this reply a few weeks ago. This is not set in stone and I could imagine this being pushed back to early-mid 2018 to allow them to finish everything they are invisioning. I find the starting tool speed super mellow, very peaceful.